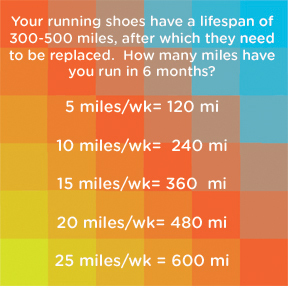 How often do you need to replace your running or walking shoes? warning: this section contains mild mathematics that some readers may find disturbing. Lets play around with these numbers a bit. Lets say you've had a pair of shoes for 12 months. To reach the 300 - 500 range you would be walking/running in the shoes a minimum of 6 miles/week to about 10 miles/week. If you're replacing your shoes every 2 years at the 300 - 500 mile mark, then you would be averaging between 1/2 mile to 1 1/2 miles a day. Studies suggest that Americans take about 5,000 steps a day, or about 2 miles each day outside of exercise. If you are using your shoes at all, then it is best to assume you need to be replacing them every 6 months. At Fleet Feet we can help you spot the signs of wear on your shoes. We look at the midsole foam to see if there's any portion that is fatally compressed, the tread to see if there's excessive wear, and we can test the shoe to see if the cushioning and stability is still in good condition. If you have any questions about the life-span or wear of your shoes, then stop by either location and we can look it over with you. Never push your luck with worn shoes.